Yes, I mean what the headline says. 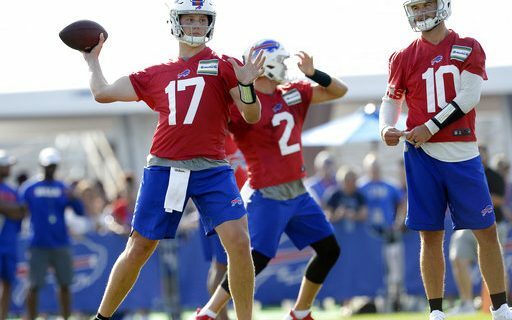 When it comes to the quarterback position, training camp was a failure for the Buffalo Bills. Why? Because they ended their run at St. John Fisher the same way they started it: Without a clear leader in the battle for the starting QB spot. Yes, it’s a little harsh. You can decide whether you think the two weeks away from Orchard Park really was a failure. But I believe there was one goal from training camp. That was to have Nathan Peterman, A.J. McCarron or Josh Allen emerge as the starter. That did not happen. To me, that’s a problem. The bottom line is neither of the three men did enough to take charge. Why do you think there was a constant rotation among the three? None of them broke away, and demanded that they get the starters reps. To me, the constant shifting of each with the #1, #2 and #3 units masked the fact that the coaches did not have an idea of which guy to put in each spot. That’s a failure among Peterman, McCarron and Allen for not playing well enough to make that clear. Should we be surprised? No. Nothing in the careers of Peterman or McCarron would tell you that one of them is built to be a starter. Allen is, but he’s not ready yet. Yes, all three played well in the preseason opener against Carolina. Greg Gabriel’s scouting review confirms that. It’s a good sign. Maybe these guys are gamers, and shine more in that setting than they do in practice. But I have learned never to read too much into preseason games. Good or bad. Who was each playing with? Who were they playing against? What kind of game planning or scheming did the offense do? How about the Panthers defense? My point here is…why was Peterman chosen to start? Why is McCarron likely to start Friday against Cleveland? Peterman probably got the nod because he’s been here before and started last year. Was it because he earned the start in camp? No. Will McCarron start Friday because he had a good week? No, especially not when he spent time with the third string. If it happens it will be because it’s his turn in the rotation. The heck with the rotation. There’s only a rotation because neither guy has moved ahead. If Peterman played so well against Carolina, and the coaches see that, he should start against the Browns. The QB battle has gone through an entire offseason of OTA’s and minicamps. Now it’s gone through nearly three weeks of training camp. Do we have any idea who’s in front? Do we think Sean McDermott and Brian Daboll have any idea? The old cliche goes “When you have two quarterbacks, that means you don’t have one.” Exactly. Neither Peterman or McCarron has done enough (or has the talent) to win the job. So maybe it’s time to stop messing around. We all know that those two are only holding the job until Allen is ready. So maybe I shouldn’t be too concerned. Maybe it doesn’t really matter. Maybe Allen will soon be named the starter, and the concern over Nathan and A.J. will go away. We’re slightly over three weeks away from the season opener. It’s time to pick a guy and get him ready. Or it’s time for one of the three to pick themselves and make it an easy decision. This is a critical next week. Someone has to emerge, or it’s going to be Allen’s job by default. But there’s no denying that because none of them have emerged, training camp was a failure at the quarterback position.